Some say the magic withered away slowly, escaping as if it never existed. Others recall that the silence just happened suddenly. The pain, however, is the same no matter how the story is told. There are a few Tarla themed items that go for a hefty amount of Neopoints around the Trading Post. 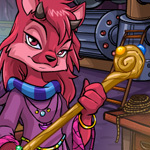 Such as Tarlas Scarf and Tarlas Underground Workshop Background, both wearable items for your own enigmatic Neopet. Just like the nature of her business Tarla remains a bit of a mystery. An enigma of an Ixi on the top of the mountain. So, I braved the snowy peaks and harsh winds of Terror Mountain to sit down with Tarla for an interview. It is the time of the year to make fresh starts as you are beginning a new semester of classes. Summer is ending and it was probably a fun and exciting one going to the beaches of mystery island and soaking up the sun. But alas, school is starting and you must get prepared so you can have a great year! I am going to list very important must have items for you to have a successful first day back to school. Beyond The Clothing At The NC Mall! There are two amazing games, Patapult and Wonderclaw, for you to play and win at, but I wanted to go in depth on three of the other places you can visit in the NC Mall. There is more to it than piles of gift boxes, really stylish superpacks, and wigs galore. So have some fun, explore around and see what places in the mall you like best, and finish off your visit to the NC Mall with an amazing Elephante party! The work day was exhausting but productive. I got a lot done. I even dug up some Limited Edition Plushies by following a mysterious trail from a specialty plushie shop that took me to an underground plushie haven. Back home, Natalia and I sit next to the fireplace, sipping tea. I remember the day I first met my new mom. I was scared and shivering in the pound. Alone. I didn’t talk to anyone and everything was a blur for a long time. I couldn’t see clearly. They were just big blobs who came close and then went far away again. Then there she was. A short, thin woman with blue hair, with wide eyes and a big smile that seemed to light up the cold four walls as though the ceiling had burst and the rays of sunshine that I almost never saw had come pouring through. She was looking at me as though expecting something magical to happen. I didn’t know what to do so I just sat there, my eyes blurry, waiting for her to nod and go on to the next room. She didn’t. She nodded to a Pink Uni next to her and they both walked away. My heart thudded. The air felt thick around me. I wanted to bang on the walls, on the steel bars, on the floor, and beg the pretty lady to come back. I slumped onto the floor on the side of my four walls. For once, I was happy not to be able to see clearly. The floor was all I needed to see now. But then, after about twenty minutes, I heard the faint telltale sounds of footsteps. They grew closer. The door swung open. It was her: the lady from before. The Pink Uni was smiling and so was she. The lady knelt onto the floor and opened her arms. For a moment, I couldn’t move. It felt like my paws had melded into the cold floor. Then, like an electricity jolt, my body sped forward. She scooped me up and twirled me around, like a scene out of a movie. Then she fished out a little object from her pocket. It had two circles and a thin line connected them. She put them on my face. It was a warm, summery day when I strolled through the Neopian bazaar and into the bakery in search of a sweet snack. Inside, I was greeted by a blue Kacheek wearing an apron that was absolutely coated in flour. The sweet scent of pastries and desserts filled the air. I felt my stomach growl. “Yo!” said the Kacheek behind the counter. “Can I help you?” I nodded, and started scanning over the huge variety of baked goods behind the glass cases the lined the walls of the bakery. “I’ll take… I’ll take uhh…” This decision was going to be harder than I thought. “I recommend the cinnamon rolls. Lots of different kinds. We got ya Aisha cinnamon rolls, ya pumpkin cinnamon yurble ears, and the always popular angry cinnamon roll,” the Kacheek offered. “I’m the Breadmaster, by the way. Nice to meet ya.” “Nice to meet you too,” I replied. I had heard great things about the prestigious Breadmaster and his incredible loaves and desserts. It seemed plain wrong to turn down a suggestion from the master himself. “How about just a regular cinnamon roll? Those look tasty.” The Breadmaster reached into the glass case and pulled out a thick, bronzed roll dripping with icing. It was still warm when he handed it to me. “So? Whatdya think?” asked the Breadmaster. The smell alone had me salivating. As soon as I took a bite, I knew the answer to his question. The roll was soft and doughy inside, with a crispy exterior. There was just a hint of cinnamon and a touch of sugar. The icing on top was a perfect creamy compliment to the roll. “That’s the most delicious thing I’ve ever tasted!” I exclaimed. “How could you possibly make something so delicious?” “Well… I’ll tell ya what, kid. Usually I don’t let anyone into my kitchen, but since it’s slow today and ya seem like a nice gal, I’ll let ya take a peek while I whip up another batch.” What an honor! I started a new job a year ago today. You see, there are some jobs from the Employment Agency that aren’t… well, advertised. For example, working for Dr. Death. I had been created as a Yellow Blumarroo about two years ago. Shortly after, my owner decided to leave Neopia, but before she did that, she abandoned me. She said it was so I could hopefully find a forever home. I spent, it seems, an eternity in a dark, metal cage in the pound. In reality, it was about 6 months. That’s when my current owner stepped in. She came into the Pound one day, and before I knew it I was on the way to her home in Neopia Central. She told me, later, that she hadn’t meant to adopt a pet that day, not really. She was just looking. But when she saw me, she knew I was the pet that had been missing from her account. I joined an Ashia, a Gnorbu, and a Lupe. My owner painted me Faerie. Life was just so… perfect. I had gotten lucky. But, I still remembered the Neopets I had met during my time in the pound. They had been so hopeful! “I know I’ll get adopted someday,” I remember one saying, “I believe it.” Another pet told me one day, “I won’t be here for long. I know my forever owner is out there.” I wasn’t okay sitting at home, doing nothing. I decided to find a job where I could help these Neopets. I ventured to the Employment Agency the next day. Did you ever notice, while waiting for a job coupon, that there is an unassuming white, almost shadowy door in the back corner? No? That’s not surprising, it’s not meant to be easy to spot. Sometimes, it’s not there at all. I did see it, though, and had a feeling that I was supposed to go through it, so I did. There was a stern looking Grey Uni sitting at another desk. This one was different. There were no faeries, no colours, all was quiet. It was a little eerie, to be honest. This was the place to find jobs from the Employment Agency that are a little different. A little dangerous. Not for the faint of heart. But I was brave. What are showers you say? Why they're those cute little items that seem to fall from the sky upon your pet at a constant rate. Sounds adorable, right? I turn around and look at her through my glasses, trying to read her expression. Happy, I decide. She’s happy. Just like the nature of her business Tarla remains a bit of a mystery. An enigma of an Ixi on the top of the mountain. So, I braved the snowy peaks and harsh winds of Terror Mountain to sit down with Tarla for an interview. Learning is fun - book 3 of 9.